A well-thought out cloud strategy specifically tailored to your organisation's needs can help combat costly mistakes and avoidable errors. The data landscape is undeniably evolving. So much so that an increasing demand for more versatile data storage and IT services has spawned the way for the next evolution of on-demand computing power. We’re talking of course, about the hybrid cloud. As such, more and more businesses are now realising the value of hybrid cloud as a means to substantially improve the efficiency of its operations. Hybrid cloud is a platform that seeks to blend the forces of public and private cloud. Theoretically it is the ideal solution to modern infrastructure needs, allowing organisations to leverage the capabilities of public cloud platform providers, without offloading the entirety of their data to a public cloud data centre. This balance provides a great deal of flexibility for businesses. It enables them to take advantage of the efficiency and innovation benefits that the cloud offers, while maintaining control over more sensitive data that may have stricter security or compliance requirements. However, the decision to embrace hybrid cloud is one that should not be taken lightly. The journey is typically complex, with many overwhelmingly important decisions to be made in a seemingly short space of time. With so many options for partners and solutions, it is normal for those unfamiliar with hybrid cloud to feel confused and apprehensive about what the best strategy is and how to start their route amidst so many possibilities. Time and time again, we see businesses fall foul of the same highly-technical errors, which can generally be broken down into two major areas; the journey to the cloud and data security. Thankfully, the most common mistakes are also the easiest to correct. When it comes to the cloud journey, one of the greatest mistakes we see is that companies often rush into a hybrid cloud solution with outdated infrastructure and are unprepared for the demands of a more modernised process. Usually, the decision to adopt a hybrid infrastructure is spurred by business objectives and not from an IT standpoint. For this reason, many businesses enter their own journeys without the right tools to support a major modernisation and cloud adoption strategy. What we mean by this is that too often companies become hooked on the idea of hybrid cloud, without putting the processes in place to upgrade existing legacy IT systems and tools that have been optimised for traditional processes, rather than cloud-based infrastructures. Another crucial error is that businesses so often fail to appreciate the scale of implementing the hybrid cloud and start off thinking they can do everything by themselves. By biting off more than they can chew, organisations can quickly find themselves and their existing infrastructures overwhelmed by the task at hand, and unable to leverage the full range of benefits that the cloud offers. And even if these initial mistakes are avoided, data security all too often comes into play. When it comes to cloud computing, we must never stray away from the notion that at its core is data, and protecting this data should never be overlooked. However, businesses are generally turning to hybrid cloud to create a more robust and agile system, without giving data security and compliance the attention it requires. Far too often, businesses are too complacent about data-security and they fail to ensure that they are properly protected. With GDPR taking effect across the EU and businesses being forced to analyse their data security strategies more than ever before, complacency simply cannot be tolerated. 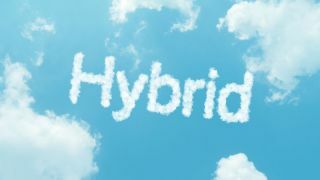 To ensure success and eradicate needless errors, any company adopting a hybrid cloud strategy should firstly be certain in the knowledge that its business goals align with its IT aspirations. What exactly does this entail? Well, it means that before all else, a company needs to clearly identify exactly how a hybrid cloud strategy will help to achieve key business objectives, and then work out how to provide their IT departments with the right tools and know-how to facilitate this advancement. This will crucially help the transition by providing the internal framework needed to facilitate a major change to operations. Next, businesses must acknowledge the importance of having patience and taking things gradually. Many common errors arise in situations when a business is too restless, as they frantically pursue rapid change. Time and time again businesses have jumped in at the deep end and taken on every aspect of the transition at once, which naturally results in the business in question becoming overwhelmed by the scale of transformation and slipping along the way. Therefore, the best way to support a cloud set-up is to find the starting position that best suits a business’s specific needs. Give this the most thought, as it will have a major impact on the rest of the journey. Once a clear strategy has been identified, the most effective way to eradicate mistakes and save precious time and money is to turn to already-established third-party data centre providers that offer the expertise required. These providers are designed to allow users to experiment with cloud strategies and, by exploring different solutions through a third-party in external data centres, businesses can identify what methods are the most suitable before making a major investment. Last but certainly not least in terms of a business’s priorities, is data security. Our advice to businesses in terms of data security is that it is essential to be more open-minded. It is especially vital to concentrate your efforts on more than one area, and to take a holistic view and put the relevant underlying infrastructure and systems in place to recognise if somebody is trying to steal your data. This will provide a much more unified defence against cyber threats which will prove to be invaluable in the face of GDPR and sophisticated cyber criminals. By abiding to these steps, businesses will be far more equipped for the new world of data storage and able to make the most of all the innovations that the cloud has to offer.